On 16 October, the State Government released the Reforming the Victoria Planning Provisions discussion paper for consultation as part of the Smart Planning project initiated by the current government. In December, we made a submission to the State Government in response to the proposed reforms. While broadly supportive of the stated intentions, we raised strong concerns regarding the proposals outlined in the Discussion Paper, and in particular criticised the the lack of detail regarding proposed reforms to the Victorian Planning Provisions, and the lack of broad public consultation. Significantly, the proposed changes contemplate an increase in the classes of applications which can be assessed under VicSmart, which would therefore not be subject to public notification, removing the ability for planners to exercise discretion when issuing some types of permits for heritage places, and eliminating third party notice and appeal rights. Fences, swimming pools and spas (and associated equipment), decks, nondomestic disabled access ramps, and electric vehicle charging stations if they are not visible from a street (other than a lane) or public park. Services normal to a building other than a dwelling, including chimneys, flues, skylights, heating and cooling systems, hot water systems, security systems and cameras, downpipes, window shading devices, or similar if not visible from a street (other than a lane) or public park. Clarify a planning permit is not required for roadworks which do not change the appearance of a heritage place or which are generally undertaken to the same details, specifications and materials. Introduce an exemption from notice and review for roadworks, electric vehicle charging stations and services normal to a building other than a dwelling. Construct and install services normal to a building other than a dwelling including chimneys, flues, skylights, heating and cooling systems, hot water systems, security systems and cameras, downpipes, window shading devices, or similar. The exemption for fences is particularly concerning, and has been the subject of previous National Trust submissions to the State Government. The exemption of bicycle paths is also a significant concern, with a recent proposal for a bike path along the central median in Sturt Street, Ballarat, providing an example of how the creation of new bike paths can undermine heritage significance. Notably, VicRoads has just capitulated on this plan following community concerns, highlighting the importance of public consultation for such projects. We are concerned that the reforms that have been gazetted will have unintended consequences, and maintain our position that having a permit trigger for such works is the best way of ensuring that discretion is exercised, and best practice followed. 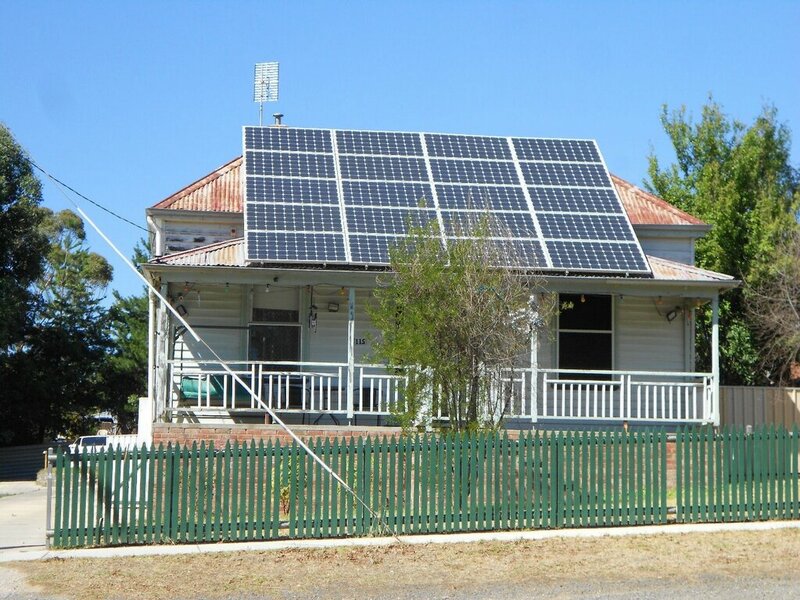 Image: solar panels on a historic house in regional Victoria, by Lisa Gervasoni.